After lighting the sacred fire that would burn throughout the TRC national event in Saskatoon, residential school survivors, their families, the Commissioners and others walked to the opening ceremonies. In this image, children carry banners with the names of the residential schools that operated in Saskatchewan. Photo: Sandra Cuffe. 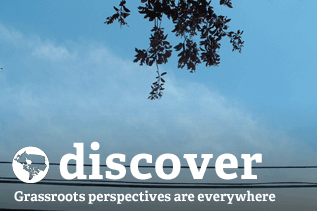 Want to get out newsletter in your inbox every two weeks? Sign-up here! 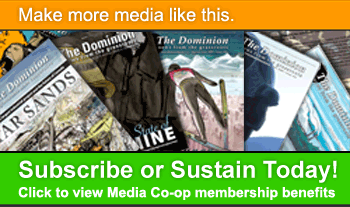 Summer is well upon us, and The Dominion and the Media Co-op continue to keep grassroots media hot! If you haven't yet picked up a copy of Issue #83, now might be a good time to download a PDF version. 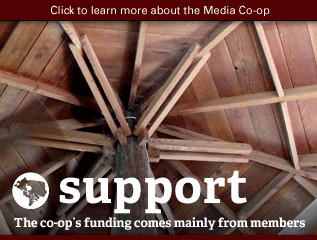 Or better yet, subscribe or sustain, to help build co-op media across Canada! 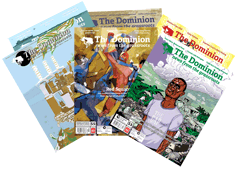 While this month's journalistic offerings from The Dominion contain a sweltering array of articles that dissect Canada's “nice-guy” image in Latin America, the story doesn't end on the magazine pages. Online, Dawn Paley follows up last month's cover story on Canada's role in training Mexico's federal police, with one of the few pieces examining corporate Canada's interests in Paraguay's recent “soft coup.” The dust had barely settled before the South American country's new government re-opened negotiations with Montreal-based aluminum giant Rio Tinto Alcan, and Canada expressed its support for the new regime. From the east side of Turtle Island, residents of K'jipuktuk (Halifax) led the charge against the federal government's “freezing” of funding to the Cultural Connections for Aboriginal Youth. 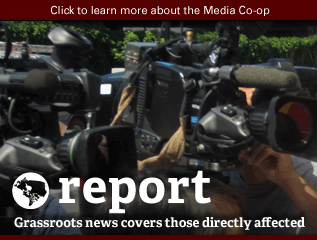 The Halifax Media Co-op was the first news organization to report on the cuts, and was there toreport on every step of community planning, and action. Sure it's hot out, but there are better ways to cool off than a funding freeze, no? 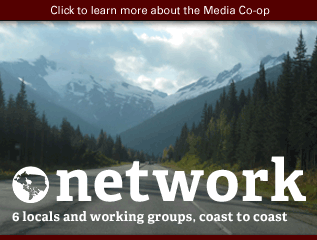 Vancouver Media Co-op stalwart and newly-hired Vancouver-based Dominion editor Sandra Cuffe headed to the flat lands of Saskatchewan, in pursuit of some truth. She found that residential school survivors were not yet reconciled with the Harper government's apology, which lends credence to the new hot hashtag #apologyhypocrisy. 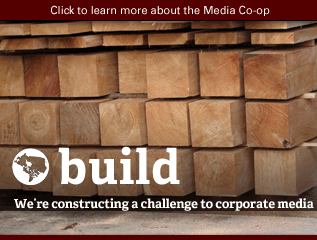 In Montreal, the Co-op média de Montréal is following the fight of the Algonquin of Barriere Lake to keep Resolute Forest Products (formerly Abitbi-Bowater) from clear cutting their land, and still keeping tabs on those pesky student demos, now at 82 nights and counting. 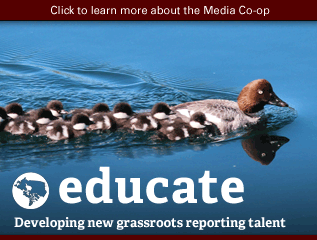 And if you're in Montreal, keep an eye out in the coming months for our Community Journalism Across Generations series of workshops and mentorships for young journalists and media activists, coming this fall! 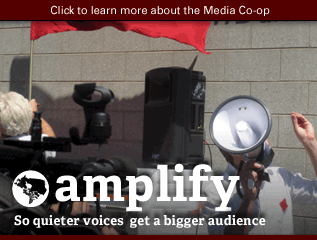 In Toronto, the Toronto Media Co-op gives no quarter to that city's "finest." Whether it's reporting on cops getting cleared on charges related to violent beatings, or detailing G20 defendant Alex Hundert's sentencing, the TMC maintains a vigilant eye on the GTA and beyond. So get off the couch. Disconnect from the screen. Grab a camera, a notepad, a recorder. 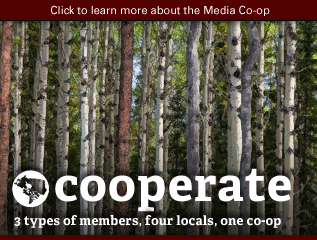 Never mind the mainstream, it's time to join up with the Media Co-op. It's time to Own Your Media.